These puppies are now in their forever homes. 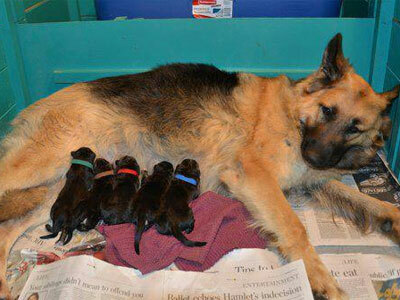 High Caliber Shilohs is thrilled to announce what is sure to be an exceptional litter! Puppies are expected in early September from our tall, dark and handsome boy Colby and Shamrock Shiloh’s big, brawny beauty, Diamond. Both of these Shilohs are wonderful examples of the breed and their puppies will carry a lot of old line Shiloh blood, with outcross at only 7.8 percent but with genetic diversity maintained by a 10 Generation I/C of 15.91.